Recent publication of an impressive art book Lithuanian Artists in North America is noteworthy in many ways. Art books are often considered a very "in" thing to have in our home, showing love for the arts and current trends in our culture. This new art book, assembled by Algimantas Kezys, goes beyond trends. It brings readers stirring feelings of loyalty and respect for their homeland. Works from 87 artists are exhibited in this impressive volume. The artists have been exhibitors in Dailė '91, '92, and '93 which had their theme as a mini-retrospective. A reader of this book will be pleased to see photos of the artists themselves along with reproductions of their work, arranged in chronological order with the view of showing the development of the life's work of each of the artists. This book brings to our attention four unlabeled categories of Lithuanian artists currently living and working in the United States and Canada: 1) group of elder artists educated in their home country, Lithuania, before their arrival to America after World War II; 2) those who received their training in post-war Europe while waiting for the opportunity to emigrate to other countries; 3) younger artists born after the war and who have been educated mainly in the United States and Canada; 4) the new arrivals, mostly students, who settled in these countries since the fall of the Soviet Union. 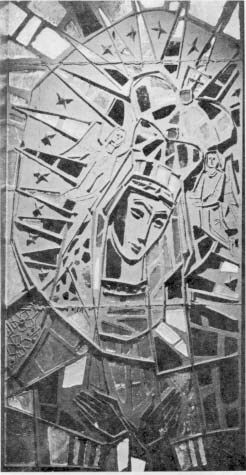 The first group is represented by such "veterans" of Lithuanian art as Vytautas K. Jonynas, Antanas Tamošaitis, Anastazija Tamošaitienė, Viktoras Vizgirda and some others. They are shown in the book more extensively than their younger counterparts. Their life's work described and reproduced in photographs reveals their concept of artistic expression as relating to their heritage and the ways of the "old country." Even the most recent of their works seem to express strong faith in folklore tradition bringing back to life images of ancient folk legends, of old heroes of Lithuanian history, or landscapes of their homeland. 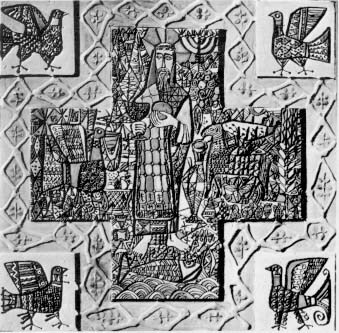 Works by Jonynas exemplify the progression from the old to the new moving from traditional woodcuts to modern mixed mediums, as exemplified in five great murals where he used bas relief, sculpture, glass mosaic, and fresco painting in a single piece of work. The second group of artists were mostly students during World War II who completed their education in the art schools that the refugees had created for themselves in post war Europe and who later settled in the United States and Canada. The most prominent ones among them are Vytautas Ignas, Elena Urbaitis, Juozas Mieliulis, Albinas Elskus. The old traditional icons have left their mark on the works of some of these progressive artists while others, having assimilated new ways of expression, have moved to new directions. 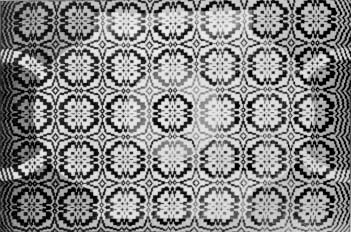 There seems to be more pure formalism and abstraction in the works of these artists than in those of their predecessors. The third section of exhibiting artists in this book received their art education in America. Printer Irene Valinčius uses in her work only basic forms, as linear shapes, along with bursts of light and color in an endless series of purely formal configurations that only remotely evoke the shapes found in nature. But one is pleasantly surprised to find among these younger artists strong ties to the traditional Lithuanian folklore, such as in the painting Perkūnas, the God of Thunder, by Alexandra Eiva and others. The fourth group are the new arrivals to this continent. Most of them have been educated in the schools of the former Soviet Republic of Lithuania: Antanas and Kostas Ulevičius, Loreta Vashkus, Rimas Čiurlionis. The work of Rimas Čiurlionis impresses the viewer with his novel way of treating surface and texture. Loreta Vashkus gives a glimpse of her meticulously elaborate surrealist imagery. Others are still in their developmental stages. These artists use a wide diversity of ingredients that are eternal in artistic expression. They exhibit international talent that is consistent with their inborn powers. In some cases, the signs and symbols of ethnic heritage become the dominant component. Jurgis Daugvila. 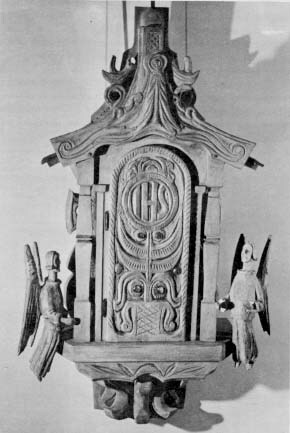 Tabernacle, 1989, wood, 72"x29"
Vanda Balukas. #60,1991, oil on original linen, 36"x54"
Janina Marks. 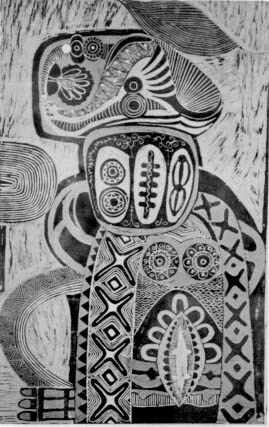 From the series Man and Woman, 1975, linocut, hand-colored, 50"x36"
Vytautas Kašuba. St. Bonaventure, 1965, hammered lead sheets. 60" high. 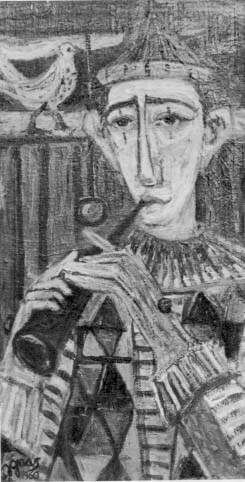 Vytautas Ignas, Clown with Wind Instrument, 1960, oil, 29x15"
Anastazija Tamošaitienė. Lithuania, 1946, knotted pile, 65"x33.5"
Rimas Vizgirda. Gold Head, 1990, ceramic, 24" high. Julius Valiūnas. 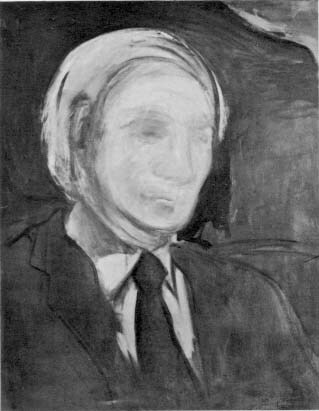 Lithuanian American, 1990, oil, 28"x22"
Aleksandras Marčiulionis. 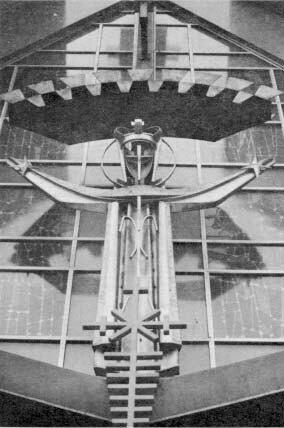 St. Casimir, c. 1966, aluminum, c. 8' high. Zita Sodeika. 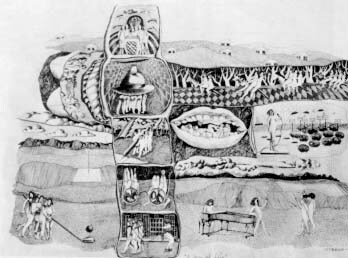 A Way of Life, 1975, pen and ink, c. 20"x30"
Ada Korsakaitė-Sutkus. 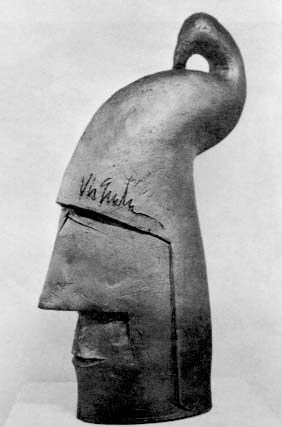 Melchisedech, 1953, ceramic, 15''xl5"